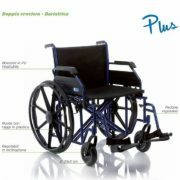 Folding wheelchair for obese series Plus CP300 sitting 60cm. 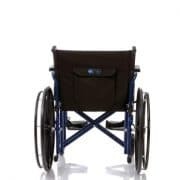 Double, steel stabilizing frame, padded and washable black nylon seat and backrest, backpack pocket.Full back wheels (Ø 60 cm), black PU tires. 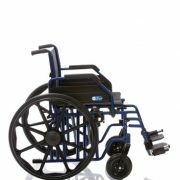 Black front PU wheels (Ø 20 cm – 5 cm thick) with steel fork suitable for wheel adjustment.Removable short armrests with PU padding.Footrests extractable, adjustable length , removable and replacable with black plastic footboard and heel strap.